Minister Ravi Karunanayake said a mechanism to regulate all the elevators, which are being operated, would be introduced shortly and that a cabinet paper would be presented next week in this regard. 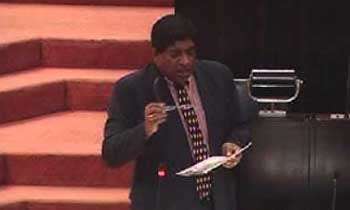 He told parliament that there were 25,800 elevators being used in Sri Lanka but none of them had been registered. "We will introduce a mechanism so that all these elevators should be registered annually. A copy of the certification should be displayed on the elevator. We will present a cabinet paper in this regard next week," he said. He said an individual was killed due to an incident involving an elevator at Nawam Mawatha a few weeks ago and added that the President and the Prime Minister made recommendations after the incident that a mechanism should be initiated so that there is someone to take responsibility on incidents involving elevators. Is it genuine initiative? or is it the way to earn some thing by the govenment? This is just a basic thing Mr. Ravi Karunanayake please do it or else we don't meet anything close to a developing country. There are many more things running in this country un registered with the blessing of politicians. Just because a few ministers got stuck there is no need to make a big fuss about it. It's a general practice to have annual maintenance for any type machinery but not display as said. Please do install more faulty elevators in Parliament. Not limit to calibration of elevators. Consider of Medical lab equipment, Utility meters. Passenger transport buses. Waterboard charging from Rs. 3200/= meter checking. Very unfair. Use new technology for utility meters. It will save lot. Mr. Minister, do not make a fool of yourself Let Patali who is an engineer (batch top) handle it. So many elevator mishaps have happened including resulting in death. When it happened to you then it warrants a discussion at the highest level? seems we the general public have to make the MPs go thru similar situtations to understand public agonies n bring the required change..